× four = 4 Required Please enter the correct value. In yet another reminder that we live in a global economy, events in Japan are setting up to boost liquefied natural gas (LNG) stocks in 2014 and beyond. 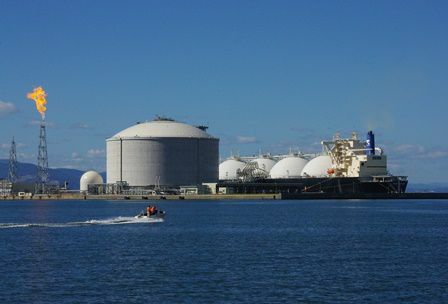 Japan's appetite for LNG has ramped up dramatically over the past several years thanks to the 2010 Fukushima nuclear disaster that prompted the closing of virtually all of that country's nuclear reactors. As a result, we've seen a massive shift in how Japan generates its electricity. While in 2010 nuclear plants provided about a third of Japan's electricity, now they provide almost none. Natural gas has been the fuel of choice to fill the gap. Power generation via natural gas has risen from 32% in 2010 to nearly half today, which is excellent news for LNG stocks in 2014. In December, Japanese utilities set an all-time monthly record by burning nearly 5.3 million tons of LNG. And this trend is still just getting started. What's more, the Japanese have increasingly been turning to natural gas to heat their homes. But Japan has a problem – one that will ultimately benefit LNG stocks in 2014. Japan is already the world's biggest importer of LNG, accounting for nearly 40% of global demand. But that LNG has gotten more expensive over the past year, thanks to the aggressive money printing by the Bank of Japan. While the monetary stimulus is intended to stimulate Japan's long-moribund economy, it also has caused the yen to plummet against the dollar over the past year. That raises the price of imported products like LNG. Combine that with dollar-denominated and oil price-tied LNG contracts (currently between $16 and $18 per million BTU) and you can see Japan's dilemma, especially when the price is closer to $4 per million BTU for natural gas in the United States. Since Fukushima, LNG import prices are up 75%, according to The Wall Street Journal.